Projects such as the development of Cradle Mountain are necessary for the future of our state. The TCCI believes the March 3 poll will be one of the most important Tasmanian elections ever as the state sets itself for the next 10 to 20 years. The chamber sees a range of major opportunities and challenges ahead for Tasmania. Perhaps the most important, as an apolitical organisation, representing members of all political persuasions, is the clear message we have received – that industry and business sectors want majority Government to have control in Tasmania – whatever its flavour. We saw the previous four years, pre-2014, when Labor and the Greens tried to govern together, as a disaster for the State. We believe that only a majority Liberal or Labor government can make decisions and deliver for the State. Just in this past fortnight, we have seen the State Government sign the Hobart City Deal with the Federal Government. We will wait – both anxious and excited – to see what that actually delivers for the State capital and Greater Hobart in general. We know that the City Deal in Launceston is already delivering, which is important for Northern Tasmania. Again, whatever the flavour of the next Government, its major opportunity is the development and rollout of a Statewide Infrastructure Plan, encompassing all sectors – energy, transport, tourism, education and community. The TCCI is a firm supporter of Tourism Tasmania’s T21 goals, continuing to grow our visitor numbers, but to do that we need more authentic experiences Statewide. 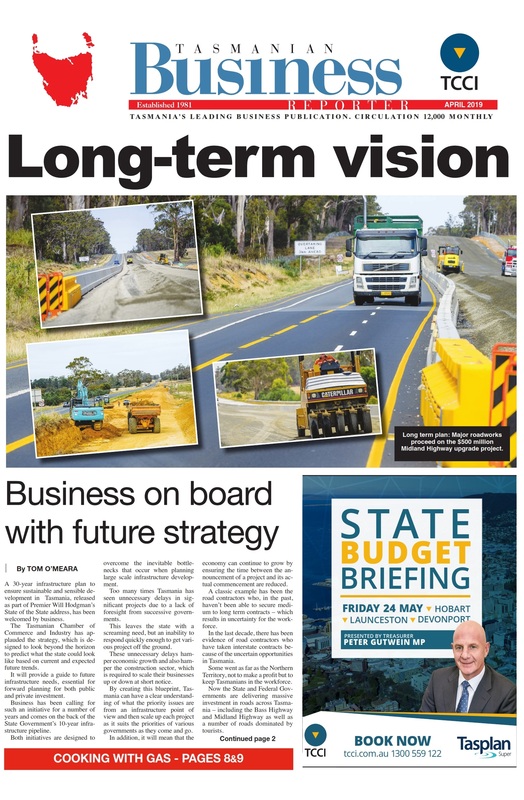 The State Government also recently announced a $72 million roads package for Tasmania – aimed at the tourism sector. Projects such as: $12 million for stopping bays and passing lanes on the Tasman Highway at Scottsdale and down the East Coast; $9 million for road safety at tourism experience on the Great Eastern Drive; $8.3 million for overtaking lanes on the Tasman Highway between St Helens and Diana’s Basin; $8 million for sealing Bruny Island Main Road; $7 million for upgrades on the Tasman Peninsula and $12.5 million to upgrade the Hastings Caves Road. Some of the proposed major developments will be challenges for the future – for example the cable car in Hobart and the overall development of Cradle Mountain – but both are necessary for the future of our State. Tasmania must continue to invest in renewable energy projects, such as the Cattle Hill wind farm, so that our dam levels are protected for Tasmanians. The TCCI believes future government must also consider withdrawing from the national energy market from a pricing perspective. We could then drop pricing for all Tasmanians, but sell power to the mainland when it’s required and when the price is high – essentially taking advantage of our historical investment in renewables, the best of any State. The TCCI has long advocated the levelling of land tax to allow the removal of payroll tax. This will stimulate business and employment growth Statewide. We must also continue to grow the State’s population, not just around Hobart and the South, but in our Northern and North-Western cities. And finally, the TCCI demands the restoration of numbers in the Lower House of the Tasmanian Parliament to 35. One, it’s more democratic, two it will provide a greater talent pool for all parties and therefore greater benefit for the Tasmanian people, for whom they are elected to represent.